The buddy cop comedy has been around for quite a few years and in many variations. We’ve had crazy cop/sane cop (Lethal Weapon), human cop/dog cop (K-9) and silly cop/serious cop (Dragnet) just to name a few. Two individuals who are polar opposites generate both comedy and tension. 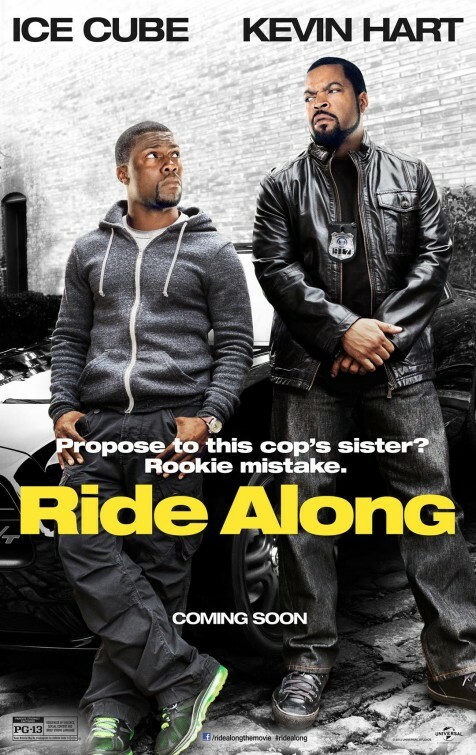 The latest mismatched comedy cop duo is Ice Cube and Kevin Hart in the comedic flick Ride Along. The film starts with a big action scene. James Payton (Ice Cube) is trying to break into a ring of passport forgers. It is all to lead to Omar, a ghost character who works in the shadows. He is a man that no one has seen but is an underworld kingpin. James has been hunting him in a stoic manner for over two years with little success. His inept support cop is Santiago (John Leguizamo). The botched sting leads to a chase through the streets of Atlanta and a fiery giant explosion. Director Tim Story delivers a colossal action salvo to the audience that hooks the adrenaline junkies. The film then turns to Ben Barber (Kevin Hart). Kevin’s part of the film opens with him playing a first person shooter game much to the chagrin of his live-in girlfriend Angela (Tika Sumpter). He wants to marry her but needs to win the respect of her brother… who is of course James Payton. Ben is a security guard, dealing with high school kids. He is a good guy who tries to guide these youngsters on the right path. Ben does have grander plans. He wants to become a member of Atlanta’s finest and eventually become a detective. Ben gets a letter saying that he has been accepted to the police academy. James thinks that the idea of Ben being a cop is a joke. He has no respect for the ‘little’ man and thinks that his sister could do much better. James decides to take Ben on a ride along to show the newbie how dangerous the streets of Atlanta can be. The rest of Ride Along is about the time the two men spend together. James keeps laying down rookie pranks on Ben, and Ben keeps his resolve to win James over. Easily the funniest scene is when they go to a firing range. Ben finds out that a first-person shooter game and a real weapon are not the same thing. The film turns when Ben discovers a clue that leads them to Omar. The last of the story begins with a warehouse confrontation which is to be the comic high point of the work. Kevin Hart and Ice Cube have a certain volatile chemistry that works more often than not. They seem to be having a ball playing against each other while playing to their strengths. More than once, the audience can see Ice Cube holding back a belly laugh from the antics of Kevin. The problem with Ride Along is that it feels like a rehash of half a dozen other films. If this had been released before Beverly Hills Cop, it would have been fresh and edgy. But Beverly Hills Cop was 30 years ago and today the buddy cop flick feels dated. Much like the romantic comedy, this genre can be saved, but Ride Along is not the savior. In the end, it is much more of an entertainment than a cinema experience. In a word, it is fluff. This will probably generate a sequel or two; as it is designed to be an episodic event. The film should do some decent numbers on the initial run and will likely be played over and over again on cable TV for the next decade.